These fried potatoes take traditional ones up just a notch by adding a light crunchy cornmeal coating. It only takes one extra step but the difference in the end product seems like it was a lot more trouble than that. They’re sure to become a family favorite for those times when folks gather around the table. Speaking of gathering around, growing up, one of my grandparent’s favorite things to watch each year were the CMA’s. We’d join them over at their house and watch everyone’s favorite singers perform to see if the rest of the world had fallen in love with the same songs we did that year. My favorites as a child were Dolly Parton, The Mandrell Sisters, and of course the Charlie Daniel’s Band. Country Music has changed a good bit over the years but the experience and values behind it still hold true – and this year is a very special one for the Country Music Awards since it is the 50th anniversary of the show. To celebrate, Martha White is going to be giving four people the experience of a lifetime. Each winner will receive a trip to Nashville for two, including airfare, hotel, tickets to the CMA live, and more. Winners will visit Nashville and experience the show first hand! You can enter once each day until the contest closes. And now, I feel like celebrating my good friends at Martha White. Did you know their test kitchens are actually located in Nashville as well? I live less than two hours from there so my mother and I have had the pleasure of spending some time with them and the people are just as good and true as they come. Every time I buy a bag of muffin mix or corn meal I know I’m supporting good folks. Today I’m going to show you a simple recipe using Martha White Hot Rize Corn Meal Mix. I always have this on hand because I use it to bread things and to make my hot water cornbread. To make this, peel and cube your potatoes. Place them in a bowl and sprinkle corn meal over them. I’m using about 1/2 cup of corn meal here but you just use as much as you need based on how many potatoes you have. I also use a tablespoon of seasoned salt. Stir this up to coat the potatoes. Fill a deep skillet with cooking oil (I’m using vegetable oil) to a depth of about 1/2 an inch. Let this heat up over medium high heat until oil is hot enough to fry in. To test this, I just sprinkle a wee bit of corn meal over the oil and if it bubbles then I know the oil is hot enough. Before adding potatoes, reduce heat to medium. 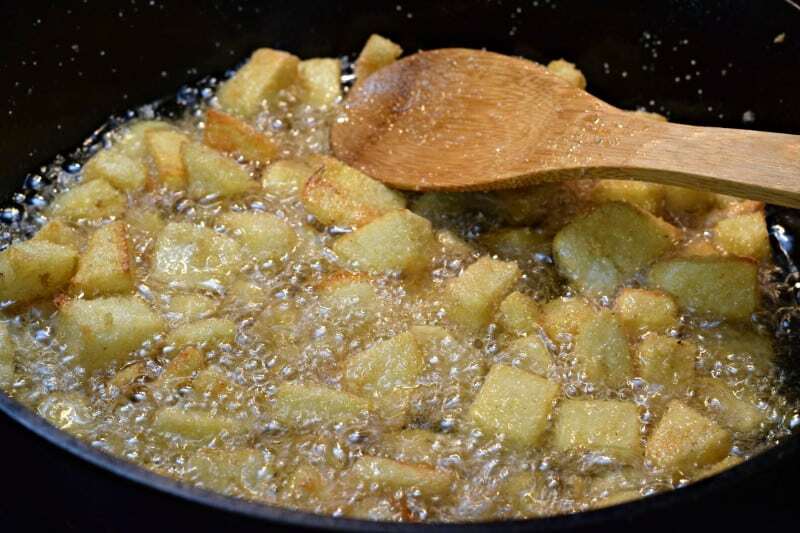 Add potatoes to hot oil and cook, stirring often, until potatoes are lightly browned and tender. Once they have reached the desired level of browning that you want, remove to a paper towel lined plate or bowl (we usually use a bowl) to serve. These are good with any meal you can come up with! Fill deep skillet with 1/2 inch of vegetable oil. Place over medium to medium high heat while you prepare the potatoes. Peel and dice the potatoes. Place in a bowl and add cornmeal mix and seasoned salt. Stir to coat. Test oil for readiness by sprinkling in a little bit of cornmeal. If the corn meal sizzles, the oil is hot enough. 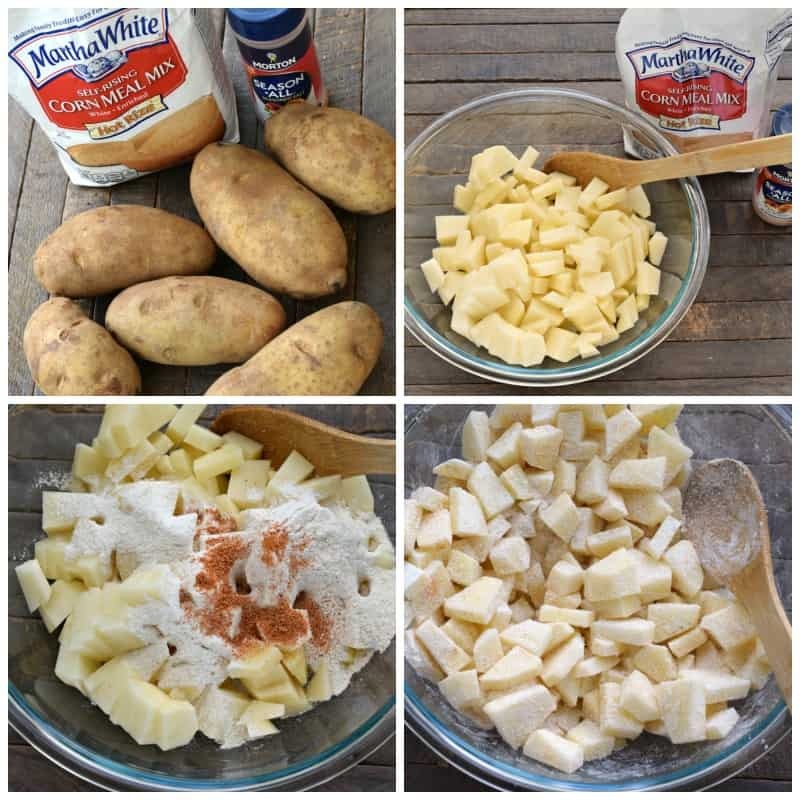 Carefully add potatoes. Cook, stirring often, until potatoes are lightly browned and tender, about 10-15 minutes. Remove to paper towel lined bowl. Enjoy warm. Thank you for visiting SouthernPlate.com. Have a great day! Don’t forget to click here to enter for your chance to go to the CMA’s! 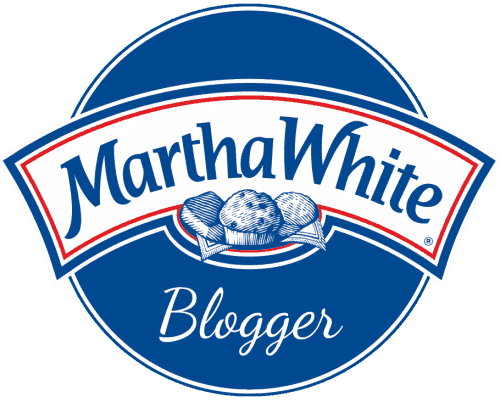 I am honored to be a Martha White Ambassador and would like to thank them for sponsoring this post! All opinions contained herein are my own. HI, Christy! This recipe reminds me of something my husband’s grandmother made – a mixture of sliced okra, yellow squash and diced taters, coated with corn meal and fried! Never thought of making just the taters! I will definitely try these soon and if you try Grandma’s version, I hope you like them as much as we did! Always had ham and cornbread with them. YUM! OH mercy, that sounds so good. I’m with you, let’s grab some ham and dig in! My mother used to fry okra and squash cubes like this. She did it when she did not have enough fresh okra for a “mess”. I never thought of using potatoes. Thanks. My grandmother used to roll pork ribs in cornmeal before frying. They were absolutely outstanding! She was a wonderful cook, and my mother followed in her footsteps and was a great cook as well. Myself….not so much on that level, even though I continue to try and try. I’m a Georgia gal. Love your blog. My Gram and Daddy cooked with corn meal. Daddy used corn meal when frying shrimp. Fried okra and potatoes are great with fresh sliced tomato and iced tea. I love Home Free, too. I watched them when they won ‘The Sing-off’ and have been a fan ever since. They have wonderful harmonies and are very funny on some of their videos. 🙂 I hope you get the chance to try them soon Jodi!! Yes, these will be on the menu tomorrow. I hope you enjoy them Heather!!! they are great, but where I live hardly anyone has heard f them. Oh my goodness, we love them!! Yes, I have my mother was from Arkansas. She used to make them both all the time in Chicago. Thank God there’s someone else who love them. I now cooked them for my family. My youngest son love them eats it cold out of refrigerator. Have anyone heard of the butter roll if so please send in the recipe it’s a dessert. Butter Roll is one of my dearest favorite recipes from my grandmother. There is simply nothing like it. Hey Miss Hazel! When I was just a little girl, the first record I begged my parents to buy me was Devil Went Down To Georgia. Back then it was a single and we played it over and over on the stereo system in the living room. My sister, brother, and I would put on our roller skates (didn’t matter that we had carpet) and make up choreographed roller skate dances to it while playing air fiddles, lol. That was back when childhood could be anything you wanted it to be, there were no limits as it was all about imagination. Later on, I picked up violin in third grade and played for several years. My grandaddy played by ear and he and I would tinker around together, me with my violin and him with his fiddle – we kept the distinction based on the music we played. Grandaddy could hear anything and start tapping his toe and out came fiddle music! I was determined for mine to become a fiddle, once I was old enough to move beyond the mandatory classical music that my teacher required of me in order to learn, but at the time it was most decidedly a violin – and an ailing one at that :). Thank you for living your life as a light in this world. The warmth of your sunshine is felt! How awesome is this? CD’s wife follows you? Amazing! You’re both wonderful, inspiring people! I was just like you, Christy, my sister and me would sing Devil Went Down to GA at the top of our lungs, and make up dances to it! GOOD MEMORIES!! Thank you for your kind words. I love your story about roller skating . Please let me know when The CDB is in your area and I’ll make arrangements for you to come to the show. You have my email address . Keep on cooking girl ! My daughter and her middle school band played at Downtown Disney several years ago. They played “The Devil Went Down To Georgia” but with a twist. They changed the fiddle to flute and Johnny became Brianna. My daughter played the fiddle solos on the flute. People still talk about it. Love the potatoes and the song. somehow my message not finish, cornmeal lpancakes are best, we always had them growing up in MO. I LOVE cornmeal gravy. I think the best way to eat it is with loaf bread and homegrown tomatoes! YUM! Oh my goodness, they are delicious!! I hope you enjoy the potatoes!! Sounds yummy! We will have to try that tonight. I hope you enjoy it Debbi!! This sounds super good. Is there a substitute for the Martha White? I don’t think they carry it here in Houston. I always have cornmeal on hand. Do you have proportion for the mix? This recipe is right down my alley on what would make a good meal better. Hi Sibyl!! Any brand should work, Martha White is our personal favorite and is readily available here. If there is no mix at all in your area try using 1 cup of cornmeal mixed with 1/4 cup flour. Sounds like my mother’s recipe. Thanks for the memories. You are so welcome Chris!! I always loved the Mandrell sisters’ clothes on their TV show! My momma would make something similar to this when I was growing up, only she added sliced onion. We called them German fried potatoes. So delicious! This brings make good memories. Thank you, Christy! I hope you enjoy the potatoes and the memories!! It does work with a lot of others Blanche!! These potatoes sound good, I will try them when I am not dieting. I like to fry okra and green tomatoes together. Cube the green tomatoes about the same size as the okra. Batter all and fry together. YumYum! Oh my goodness, I bet that is good!! Sounds good, I like to fry okra, squash, and potatoes with a lot of chopped onions. I think that is a fine way to fry all of those!! This is how my mother always cooked potatoes. I still cook them this way also. Love, love, love them. So good with peas, cornbread, tomatoes & onion. of the movie fried green tomatoes. I am a southern girl, but I don’t like to fry a lot of foods (I know, hard to believe!). I prefer the grill and the oven. Any chance you might get a good crisp on these by spraying with a little olive oil (Pam type) spray and baking them rather than frying? My mom and grandmother used to make these. Sometimes they would scramble an egg in with it! That was comfort food at its finest!! I see some others have posted this as well but wanted to say I make a dish like this called okra hash that is okra, potatoes and onions seasoned and coated in corn meal and cooked on the stove top or in the oven. It often varies depending on what I have on hand but I’ve added or replaced those veggies with squash or zucchini too. It’s one of our favorite summer meals when served with butter beans or pintos and cornbread! I grew up with a version of this, potatoes, onions, summer squash, green tomatoes, green peppers. In other words whatever was available in the garden, tho green tomatoes were absolutely a must! We just called it summer hash! Still make it when the garden is coming in, yum, yum!! Oh goodness, 2 o’clock is the perfect time!!! I never heard of corn meal pancakes. Do you just substitute corn meal for the flour? Talking about songs, check out “The End of the Beginning” sung by David Phelps. He sings with the Gaither group. I hope you had a great cookout and enjoyed the potatoes!! hi Miss Christy – I love cornmeal in anything covered in batter or breading: CRUNCH-alicious! However, I’m not familiar with self-rising cornmeal. Is it like s-r flour (added salt & leaving)? 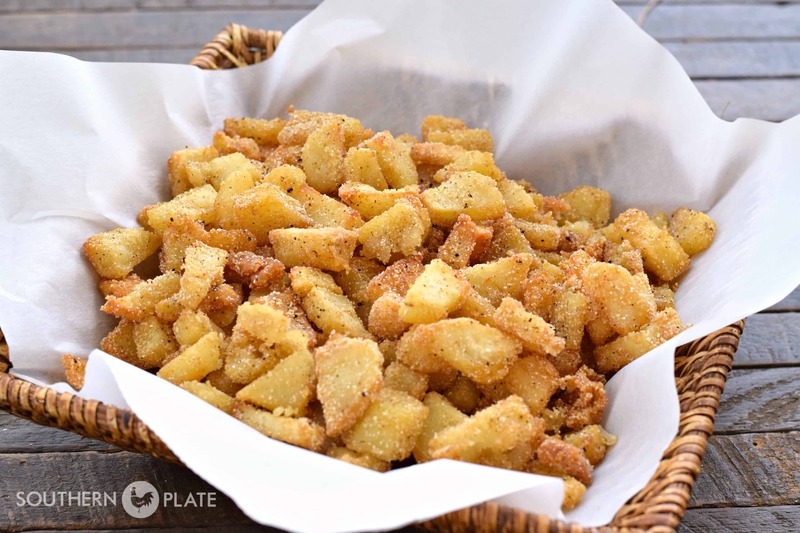 Is the leavening needed for breading, like in these potatoes? Your posts are charmingly written & full of good tips & recipes: Thanks & Happy Sptember. Make these even better by adding onions. Yes, they would be. Sadly I am the only one in my family that eats onions. Next time I make these I’m gonna use the House of Autry hushpuppie mix that you/we use on those great pork chops. My 90 year old mother makes these on New Year’s Day. That’s it, the only time we have them! lol No one knows why because we all love them and they are super easy to make but that is the only time. They go great with pork roast, black eyed peas, corn bread and greens! I would have to ask…LOL. If you ever find out let me know, it has my curiosity peaked.